The French River is located in central Ontario, and winds its way 110 km (68 mi) west, connecting Lake Nipissing with Georgian Bay. It is considered by most, the dividing line between Southern Ontario and Northern Ontario and flows through the Canadian Shield formation. A historic water shed nationally significant to Canada, the French River, also known as “la Riviere des Francais” (French) or Wemiitigoj – Sibi (Ojibway, First Nations), was firstly the route of the First Nations peoples and then the voyageurs, missionaries and explorers of early day. This river was a corridor for both travel and trade. Its waterway during the fur trading days formed a vital link for the voyageurs to reach the Canadian interior and the northwest in pursuit of the valued beaver pelts so popular in the day. Another driving factor for the European visitors was the search for the illusive passage to the orient, which would open vast trading and riches for the discoverer. Many relics from the days past still lie along the river's shores, as well, historic locations await to be explored along the way. With the first arrival of the Europeans this river played an essential role to opening up the interior of Canada and the rest of the country, and thus, holds a significant place in Canadian history. In 1986 it was designated a Canadian Heritage River System. 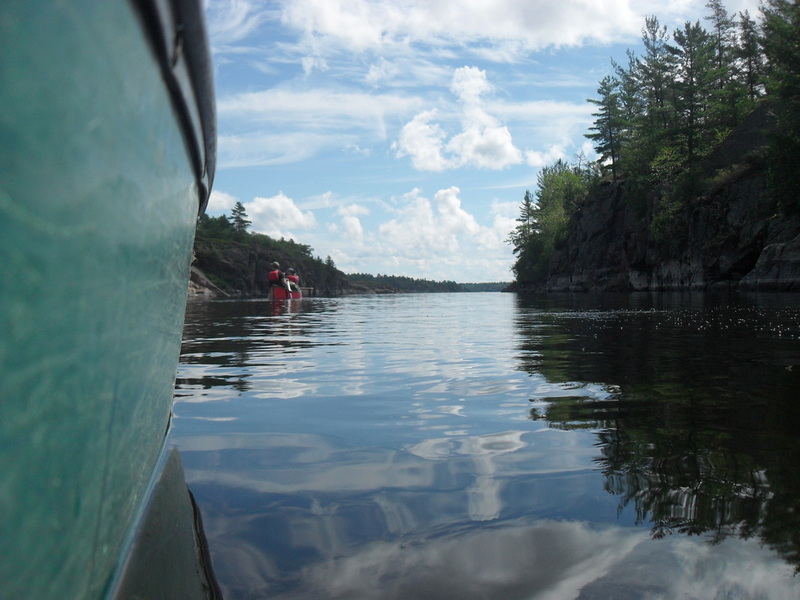 The French River Provincial Park encompasses the borders of the river and provides excellent camp sites dotted along the shoreline. 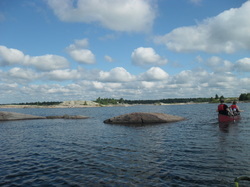 The length of the river includes gorges, rapids, and interconnecting lakes all emptying into Georgian Bay. A delta at the rivers mouth entails of cliffs, islands, and pristine blue waters and shorelines. The Canadian Shield is the prominent geological feature here, this being the oldest rock formation in existence in Canada. The Glaciers left this area with many features to be found along the shores, from glacial debris and unique formations to the etchings from the ice on the smooth rock islands typical of this area. 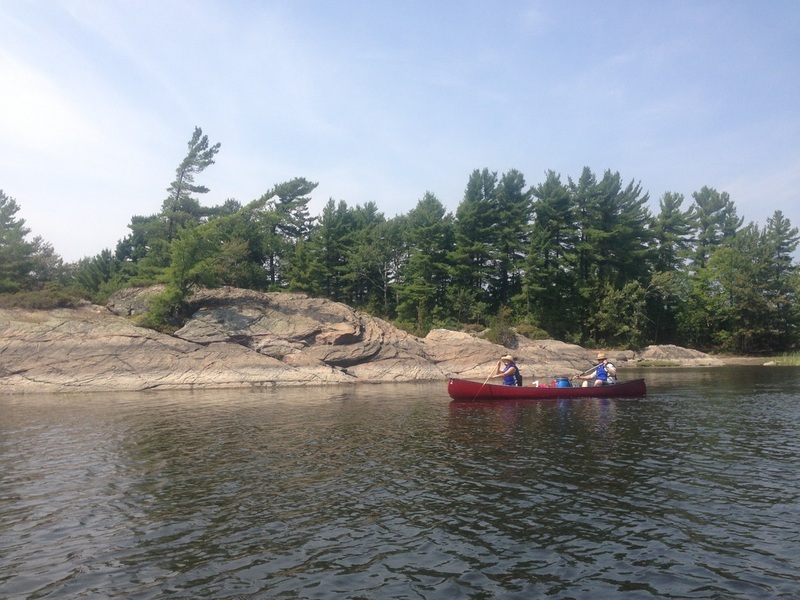 The French River has a rich diversity of both plant and animal life. It is situated where most animal and plant species reach their southern and northern limits. This catalyst creates an exceptional place to view this unique eco system in its glory. The variety of birds found on the French River includes a diverse group of song birds, water fowl and shore birds, making this an excellent opportunity for the avid birder. Many fish and reptile species common to the great lakes area exist here. Most notable being the walleye fish (pickerel) population, as well, pike, small mouth bass, and muskellunge also frequent the river. The French River also supports many other creatures of the forest such as foxes, bears, moose, rabbits, porcupines, and deer to name a few. The unique mix of plant life is also apparent on the river being the north and south geographic meeting point for many species. Here the northern boreal forest meets the southern deciduous forest in a blending harmony of traditional pine and hardwood forest species. Many other plant species exist here among them such as wintergreen, grasses, shrubs, and club mosses. The trip is primarily about enjoying the Canadian wilderness and its many offerings. There may be some who wish to experience specific historical areas, activities, or flora and fauna viewing of the area. We will arrange this ahead of time and accommodate these specific interests throughout our tour. The Toronto airport is located south of us and connecting flights to Sudbury, Ontario will bring you right to our doorstep. It is suggested that you arrive a day early to avoid jet lag on your first day of the tour. Accommodations before and after the tour are available in a shared group cabin. We offer superb meals while on trip all prepared for you by your guide. All meals are nutritious and sure to satisfy a paddler’s appetite! 4:00p.m Arrive at campsite. An overview of proper site setup and practices for good housekeeping will be covered. 7:00a.m Rise and shine! Breakfast will be prepared and we will aim to depart by 8:00 a.m to begin our first full day of paddling and sightseeing. 1:00p.m Paddles in. This stretch of the river will take us out into Georgian Bay, (depending on weather conditions, group’s ability, etc. )We will explore this rugged coast before heading back into the shelter of the French River. 1:00p.m Paddles in, this stretch of the journey will explore the shorelines and many inlets along this stretch of the river.